So, I'm getting older everyday. Yesterday I ended my 28th year of life...so now, I'm 28! Can you believe it? I can't. Only two years to thirty!!! AH! Naomi took me out for lunch and then Greg took me out for dinner. It was a great day. My friend Amy stopped over with three kids in tow. Yes, Amy only has two kids but was watching Grace for a friend. Amy brought me a yummy cake and some cute little gifts. 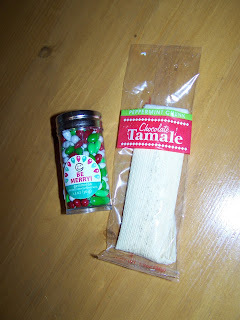 Two things you only find in Texas (chocolate covered sunflower seeds and a cholocate tamale) and a "mommy brain" gift for finding my keys...which is SO helpful because I DO have mommy brain! Greg got me a Max Lucado book that I've been wanting and Michael W. Smith's new Christmas cd...which is awesome by the way! Today, we have Grace over here. Her mother, Erin has been on the bone marrow donors list for four years and now got a call about her bone marrow being a match and needed. She flew to Washington DC yesterday and comes back tonight after just a physical. 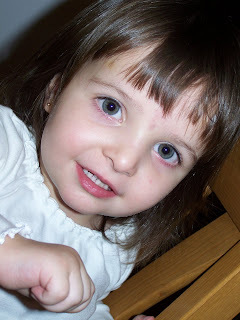 Then in a week or so she'll be going back to actually give the bone marrow. Wow! What a great gift she is giving to someone. So, anyway, it has been interesting with two little "only child" girls around here. They are both a little fiesty and neither wanted to nap. I think I got 40 minutes out of them today. Let's hope that means a LONG nap tomorrow!!! They are playing together pretty good right now, but the day has not been without its time outs! So, that's my story. Oh and I guess I'll share a prego picture. Not a big fan of the picture, but here you go anyway. 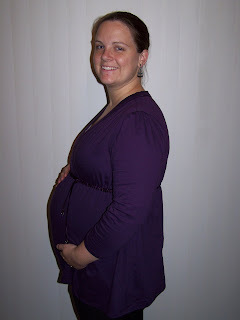 This is me at 21 weeks! You look great Jamie! I love thinking about how awesome God is and what an amazing creation is being knit together right now in that cute tummy of yours!